How did this all start? Were we all just jonesing for Rhônes? It had been two years since the 20th and final Hospice du Rhône event in Paso Robles. The Hospice du Rhône (HdR) organization still exists and continues to hold wine events, though only tiny and pricey gatherings at the Blackberry Farm resort in Tennessee. But the large annual event in Paso Robles that included seminars, grand tastings that featured hundreds of wines made from Rhône grape varieties, and related peripheral activities, is now sadly a thing of the past. A second springtime with no HdR was approaching, and a number of “regulars” who had attended the event for years started corresponding via Facebook and email about a possible get-together. We all realized that as much fun as the official seminars and tastings had been, we really missed seeing each other and missed the unofficial yearly events surrounding HdR – the Wednesday night “Pinot Pirates” dinner, the Friday night barbecue, visits to local wineries, etc. Since our informal group hailed from all over the country, our annual gatherings at HdR were the only time that many of us saw each other. I can’t recall just who first hatched the idea, but a plan started forming about getting together in Paso Robles at the time when HdR would have taken place, in late April. We ultimately decided to arrange a Friday and Saturday of wine touring and dinners along with a Thursday dinner to get things started. As is usually the case with get-togethers such as this one, a number of people who had initially planned to join in found that they were unable to do so as the date approached, but we still had a great group of longtime HdR veterans – Mel Hill, Charlie & Pat Chadwick, Terry & Joan Hyde, Bennett Traub, Mike Ripley-Lotee, and Bob Summers. 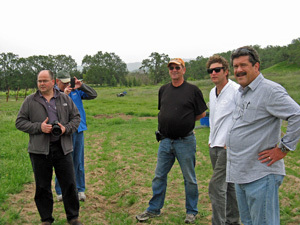 Several of us pitched in to arrange winery and vineyard visits and meals. With a sizable group such as ours, it made sense to set up appointments at wineries rather than overwhelm tasting rooms – and we were after more in-depth visits than the typical tasting room experience in any case. As it worked out, we were able to schedule most of our stops with smaller and newer producers, many of which aren’t generally open to the public. 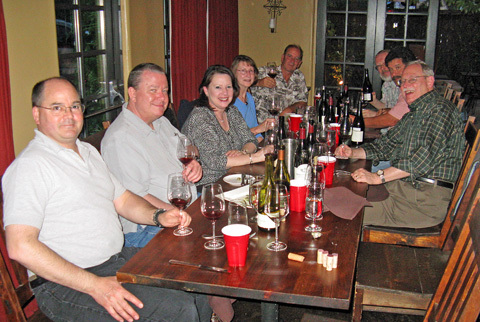 We had decided that we wanted to kick off our Rhône Reunion gathering on Thursday evening the same way we had been starting our visits to Paso Robles for HdR – with the traditional “Pinot Pirates” dinner at Villa Creek Restaurant. This dinner – where we would all bring bottles of Pinot Noir to share before diving into our weekend of Rhônes – had always been organized by local vintner Augie Hug, but unfortunately he and his wife Raquel were out of town on this occasion. Coming to the rescue was Charlie Chadwick, who volunteered to take charge – he coordinated a special dinner menu with Villa Creek chef / general manager Tom Fundaro. Even though our group was a bit smaller than at many of our previous “Pinot Pirates” dinners, we were able to dine in Villa’s Creek’s private room at the rear of the restaurant. The food was delicious as usual, everyone brought excellent wines, and having the room to ourselves gave us the perfect opportunity to get re-acquainted. Friday morning was cloudy and cool, and the forecast was for some rain during the day. We weren’t too worried about the weather since most of our appointments were going to be indoors that day, although there was one vineyard tour scheduled. We’d ordered sandwiches and box lunches from Red Scooter Deli in Paso, and I stopped off to pick them up before meeting everyone at the Melody Ranch Motel (Bob, Mike, and I were all staying there) to carpool / caravan for the day’s journey. Nicora 2011 “GSM,” Paso Robles. 59% Syrah, 24% Grenache, 17% Mourvèdre. Medium-dark purple, with bright aromas of ripe plum and cherry fruit, spice, and undertones of smoky, charry oak. Lively acidity along with a fairly rich texture on the palate, and moderately chewy tannins on the finish. Nicora 2011 “Buxom,” Paso Robles. 94% Syrah, 6% Grenache. Dark color, this featured dark berry fruit on the nose plus savory notes of grilled meat and herbs, along with a touch of mocha. Richer mouthfeel but retaining bright acidity, this finished with firm, chalky tannins – a wine that will need time to develop but showing lots of promise. Nicora 2011 “Law Vineyard,” Paso Robles. 53% Grenache, 47% Syrah. Dark color, showing slightly floral aromas along with blackberries, mocha, and spice. Big and rich but not heavy, and a big, chalky tannic finish – another wine that should reward patience. It was a short drive south from town on Friday morning for our first appointment of the day. Not far from our destination, we passed a vineyard with old, gnarly head-trained vines. I learned that this was Benito Dusi Ranch, with Zinfandel vines dating as far back as the 1920s – the fruit from here goes mostly to Ridge. We soon headed into complex of newer metal buildings and reached our destination at Nicora Wine. I’d met Nicora’s Nick Elliot about a year before when he was making his wine at the Villicana facility on Adelaida Road, but since that time, he’s moved into his new spot in a building he shares with Scott Hawley of Torrin Vineyard. Once everyone in our group had parked, we gathered together and walked into the small tasting room at the front of the building, where Nick welcomed us. From a family of contractors, Nick grew up in Coalinga, on the west side of California’s Central Valley and not too for from Paso Robles. He told us that he’s not from a wine-drinking family, and got into wine only after he moved to Paso about 10 years ago and started working in the industry. Nick said that he didn’t know a lot about wine at first, but he worked with several noted local vintners (including Eric Jensen of Booker and Bob Tillman of Alta Colina) before starting to work with Scott Hawley at the Denner facility in 2006. Nick found himself gravitating toward Syrah, and he mentioned that working at Denner was a great experience for him – fruit from lots of highly-regarded local vineyards came through there, and Nick saw a number of different winemaking approaches among the vintners making their wines at the facility. He said that when he’d worked for 90 straight days and still looked forward to work each new day, he knew for sure that making wine was what he wanted to do. Nick launched his own Nicora label with the 2009 vintage, though he continued working with Scott at Torrin until 2012 (he joked that he retired!) – since then he’s made Nicora his full-time job. The label’s name is a combination of Nick’s name and that of his great-grandfather, Ora, who started a contracting company and has been a source of inspiration to Nick as he’s built his own business. He works mostly with his favorite grape variety, Syrah, and he told us that he’s interested in contrasting warm vs. cool climate sources as well as different soils. Nick also works with Grenache and Mourvèdre for his wines and more recently with Roussanne and Viognier. Current annual production remains small, with eight separate wines totaling less than 1,000 cases. About ? of his sales are from his mailing list, and his wines are also in a few restaurants. There are two wine releases each year, which Nick said helps to stretch out the small supply. The wines have routinely received 90+ point scores from major wine critics, so the small production often sells out quickly, but Nick is not looking to expand too much in the near future. He’s also now making wine for a new start-up label to be launched next year. 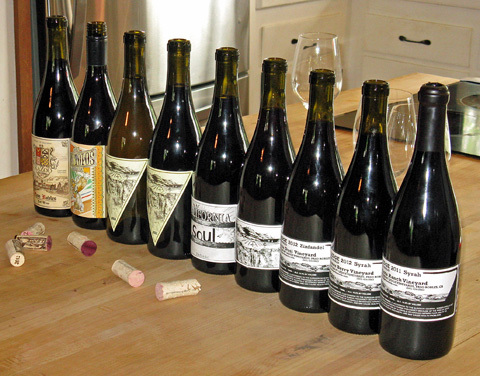 Nick had opened three bottles of his 2011 wines for us to taste – the “GSM,” “Buxom,” and “Law Vineyard” red blends. As we tasted the wines, Nick told us about his winemaking. He started by telling us about his vineyard sources – Nick has sourced his fruit from a select group of high-quality vineyards on the Westside of Paso Robles. These include Alta Colina and Carina (on Adelaida Road), Law (on Peachy Canyon Road), and La Vista (near Halter Ranch and Tablas Creek). He’s been working with a few additional vineyards in the past couple of years, including Shadow Canyon (in the York Mountain AVA), Denner, and Russell Family. Nick told us that some of the wines sourced from these sites will be vineyard designates. Nick leases some vineyard blocks by the acre so he has more say in the crop load, pick date, etc. As the fruit ripens, he goes more by taste than by brix and pH for determining pick dates. His fruit tends to be around 26-27 brix range at pick – ripe but not overly so in comparison to some other Paso producers. Nick will generally use some percentage of whole clusters for fermenting his reds, though this varies widely. He’ll foot-tread whole clusters and he’ll sometimes bleed off a little juice if he feels the berries are particularly large. Following crush, the must goes to a cold room for 7-10 days before being moved to a warmer spot to start native fermentation. Nick does not acidify his wines and avoids other additions where possible. Wines are generally fermented in 1.5 ton bins, and kept on the skins for a total of around 4-5 weeks. Wines spend about 18 months in barrel (Ermitage and Boutes are among Nick’s favorite coopers). 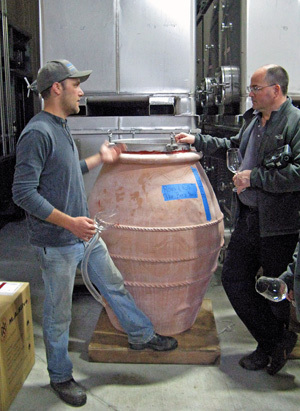 Nick also ages some wine – mainly Grenache – in concrete tanks. The 2011 “GSM” included Syrah from Alta Colina and Law vineyards, Grenache from La Vista, and Mourvèdre from Carina. The Syrah and Mourvèdre were aged in about 30% new French oak, while the Grenache was aged in a concrete tank. Even though this blend was Syrah-based, I thought the Grenache component came through strongly. The “Buxom” fruit came from 75% La Vista Vineyard and 25% Law Vineyard. Nick told us that he was able to buy fruit from the new Law Vineyard when fruit he’d counted on from another vineyard source was unexpectedly sold to another buyer and the Laws stepped in to sell him some fruit. The Grenache for the “Law Vineyard” bottling was aged in a new puncheon, while the Syrah component was in an older one. Since our tasting in late April, Nick has released some of his 2012 reds plus a new 2013 white wine. Nicora’s first white is a blend of 50% each Viognier and Roussanne. This bottling is named “The Undisclosed” – so called because that describes the fruit source for the Roussanne portion of the wine (the Viognier fruit came from Denner Vineyards). Other new releases include 2012 vintage bottlings of “GSM” and “Buxom” as well as “Euphoric” – a blend sourced entirely from La Vista Vineyard that’s the flipside of “Buxom,” with 96% Grenache and 4% Syrah. After we’d finished tasting, Nick led us through the back door of the tasting room for a brief tour of the winery. We had a fun visit with Nick – he was a great host, and he looks like he’s having a blast working on his own label and seeing it grow. 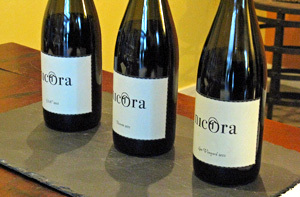 The Nicora wines are certainly in the style of bigger Paso Rhônes, but they feature bright acidity, plenty of structure for aging, and more elegance than you might expect for such bold wines. My favorite of the three 2011 wines we tried was the “Buxom” – showing some surprising cool-climate character for a big Paso Syrah – with the “Law Vineyard” a close second. Nick’s winemaking influences are very clear to see in his wines so far – as a young and talented winemaker, it will be interesting see how his future vintages may move from “Paso style” toward a distinctive “Nicora style” of wine. After leaving Nicora, we found ourselves with more time than expected before our next appointment. We’d noticed a brewpub that we’d passed just a short distance away and decided to see if they were open yet. Sure enough, Barrelhouse Brewing Company was open and proved to be a relaxing stop for us, and several of our group enjoyed samplers of their brews. But before long (and before a second round of beers), we headed back on the road, taking Highway 46 west and then turning onto Vineyard Drive for our next appointment. Catacombs 2012 Rosé, California. From saignée of co-fermented 75% Grenache, 15% Syrah, and 10% Mourvèdre, made in stainless steel. Salmon-orange color, strawberry and spice aromas. Lively mouthfeel with a fairly smooth finish. Catacombs 2012 White, California. Around 70% Viognier and 30% Marsanne (with a tiny bit of Roussanne), made in stainless steel and neutral oak. Light straw color, this showed stone fruit, lees, and a floral note on the nose. Medium weight in the mouth, with a long, lively finish. Kazoo 2012 Carignane, Paso Robles. 100% Carignane. Medium-dark color, featuring earth and spice upfront with raspberry fruit and sweet oak in support. Medium-bodied with bright acidity and moderately chewy tannins on the finish, nice. Kazoo 2011 Red, Paso Robles. 50% each Merlot and Syrah. Medium purple color, with herbal cherry and plum aromas along with earth and vanilla/oak notes. Medium-full bodied with a fairly smooth texture and grippy tannic finish. Ledge 2012 Zinfandel, Dusi Ranch, Paso Robles. From Dante Dusi Ranch, 100% Zinfandel, 50% whole-cluster fermentation, aged in new Hungarian and neutral French oak. Medium color, this displayed bright and ripe boysenberry fruit, lots of spice, and a touch of flowers on the nose. Medium weight with a bright mouthfeel and firm tannins on the long finish – nice now but should develop in the cellar too. Ledge 2011 Syrah, Adams Ranch, Paso Robles. From Estrella clone Syrah along with small amount of Grenache, about 60% whole-cluster fermentation, aged in neutral oak. Medium-dark purple, with floral aromas along with smoky red and black fruits, a gamy note, iron, smoke, and spice – great complexity. Medium-full bodied with a lively texture and big, chalky tannins on the finish – very promising but needs more time to show its best. Los Topos 2012 Grenache, Paso Robles. 100% Grenache, a little whole-cluster fermentation, aged in new and neutral French puncheons. Medium-light garnet color, with very bright and slightly candied strawberry aromas upfront along with touches of spice and dried herbs. Medium-bodied, finishing with big, chewy tannins. California Soul 2012 Zinfandel, “Mother Hips,” Paso Robles. 100% Zinfandel sourced from younger Westside Paso vines, a little whole-cluster fermentation, aged in new and neutral French puncheons. Medium-dark color, this showed less “Zinny” character than the Ledge bottling, with a darker fruit profile, more earth and herbs, and lots of spice. Medium-bodied with a grippy tannic finish. Ledge 2012 “Vineyard Drive,” Paso Robles. 48% Syrah, 25% Grenache, 25% Mourvèdre, 2% Roussanne, from James Berry and Messina vineyards, 50% whole-cluster fermentation, aged in new and neutral French oak. Medium color, featuring bright cherry and plum fruit, plenty of spice, and undertones of vanilla/oak. Medium weight on the palate with firm but not aggressive tannins. Catacombs 2011 Red, California. 40% Grenache, 30% Syrah, 20% Mourvèdre, 7% Counoise, 3% Zinfandel, aged in new and neutral French oak. Medium-dark color, smoky bacon aromas jumped out along with plummy fruit, earth, and herbs. Medium-bodied with fairly big but fine tannins, nice. Catacombs 2012 Red, California. 75% Grenache, 20% Zinfandel, 5% Syrah, aged in new and neutral French oak. Medium color, with strawberry and spice on the nose plus a touch of sweet oak. Medium-bodied and lively, with big, grippy tannins on the finish, needs time to settle down. Ledge 2012 Syrah, James Berry Vineyard, Paso Robles. 100% Syrah, about 50% whole-cluster fermentation, aged in new and neutral French oak. Medium-dark color, this showed a bigger vanilla/oak component along with ripe plum and darker fruit, baking spice, and herbs. Medium-full bodied and fairly rich, with huge chewy tannins on the finish – this will certainly need bottle age to soften. Bennett had arranged our next visit, with vintner Mark Adams. We met Mark at his Adams Ranch Vineyard in the Willow Creek area on the Westside of Paso, not far from Denner and James Berry vineyards. Mark has been the assistant winemaker at Saxum Vineyards since 2004 and has launched several of his own labels in recent years. 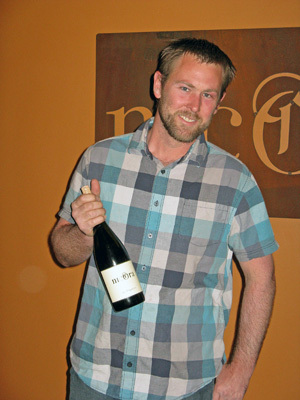 His own wines have attracted attention, and Mark was named a 2014 “Winemaker to Watch” by the San Francisco Chronicle. Mark grew up on the property where Adams Ranch Vineyard is located – he and his wife and young daughter live in the old family home there and Mark’s parents still live on the property as well. He told us that his family raised cattle and pigs when he was growing up and that much of the ranch had been grazing land, though his family also grew some grain there. Mark did not originally go into growing grapevines or making wines – his background is in film and music. He still makes music these days, even though the wine business keeps him busy. He’s been a key member of bands (vocalist and guitarist in Rancho Deluxe and One Time Spaceman) and has released a CD called Panjanatan under his own name. One Time Spaceman became the name for Mark’s first wine label – although that label is still around, Mark is no longer involved in it. But he currently has no less than five wine labels – Ledge, Catacombs, Kazoo, California Soul, and Los Topos – each with different styles, approaches, and price points (more on that later). We started out with a tour of the vineyard with Mark. The weather looked threatening but rain stayed away during our walk. 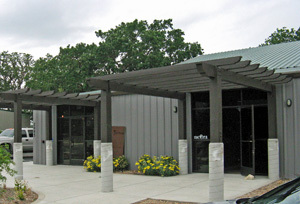 About 40 acres in size, Adams Ranch is located on a gently-sloping site. The area currently planted to grapevines is much smaller – about 2.5 acres of Syrah, 1.5 acres of Mourvèdre, and 1 acre of Grenache. The initial planting was in 2005, when Mark and some friends planted cuttings on their own roots. Some of the vines are head-trained while others are trellised. Mark told us that the vine spacing is mostly 3x8, though he’s now doing some high-density meter-by-meter planting. The soil is mostly not the calcareous shale found in some other parts of Paso Robles – it’s sandy in some parts of the property with more gravel and clay in others. The farming uses organic methods but is not certified, and Mark also tries to dry-farm as much as possible – he said he only had to irrigate twice in 2013, and he hopes to completely dry-farm the vineyard in the future. He’d like to plant as many as 37 of the property’s 40 acres, and will plant on selected rootstock. The yield from his own-rooted vines has not been great – they produced a total of only about five tons in 2013, an average of just one ton per acre. Planted clones include Estrella clone Syrah and Alban clone Grenache, with some more recently-planted 814 clone Grenache that had its first harvest this year. Mark took us by a nursery area where he is getting several new grape varieties ready to plant in the near future. He’s planning to add Roussanne, Cinsault, Counoise, and Carignane to the vineyard, as well as planting more of the current varieties. After we made the rounds of the vineyard, we walked up a hill to Mark’s house. He led us to the kitchen, where he opened a variety of bottlings from all five of his labels for us to taste. The bottlings we tried were all released within the six months prior to our visit. Ledge is Mark’s top-of-the-line label, so named because Adams Ranch is located on a relatively flat “ledge” above and just west of Vineyard Drive. Mark described the Ledge wines as more “hands-on” – showcasing vineyard sources and farming more than the other labels, which are more about the blends. Fruit for the Ledge wines is sourced from Adams Ranch and from other vineyards in the area, including James Berry, Dante Dusi, and Jada’s Messina Vineyard. The first Ledge wines came from the 2009 vintage, and Mark is now making four bottlings under that label. Mark told us that he tends to use around 50-70% whole-cluster fermentation for the Ledge wines. His wines undergo native fermentation and are typically aged in puncheons, with Ermitage, Taransaud, and Kadar being favorite coopers. Mark’s other labels are more négociant in approach. In some cases he purchases fruit to make the wines and in some cases he buys wines already in barrel and then blends them. Wine under the Catacombs label features mainly Rhône grape varieties from Westside vineyard sources within a few miles of the estate property. The Kazoo label features both Bordeaux and Rhône varieties with more unusual blends (such as Merlot / Syrah), while California Soul includes Zinfandel as well as both typical and atypical (Tempranillo / Zinfandel / Syrah / Cinsault) blends. Most bottlings are only around 100-150 cases. I really enjoyed our visit with Mark – it always feels a bit special when a winemaker invites you into his home to taste wines, and gathering around his kitchen island with our group was a memorable experience. I’d tasted one of Mark’s earlier wines a couple of years ago, but this was the first time I’d had the opportunity to taste through so many of them, with examples from all of his current labels. The different labels give Mark the flexibility to work with different styles, for example contrasting wines with higher alcohol and more concentration vs. lower alcohol and more elegance, as well as playing with some unconventional blends. They also allow him to work with a variety of fruit sources and aim for different price points – and it’s clear that they allow him to have some fun with the offbeat label designs too! The Ledge wines were clearly the most “serious” of the bunch but several of the others were very nice and represent fine values. By and large, the reds are not shy wines – they still display the ripe and bold character that Paso Robles are known for – but they are less monolithic and more nuanced than many bigger Paso reds can be. The wines showed fine balance throughout the broad line-up we tasted and were quite good across the board. The Ledge 2011 Adams Ranch Syrah was my favorite of the wines we tried, though the Ledge 2012 Dusi Ranch Zinfandel, Kazoo 2012 Carignane, and Catacombs 2011 Red deserve special mention too. Mark is a man of many talents, and it should be fascinating to see where he goes with his many wine labels, and to see how his vineyard at Adams Ranch develops in the coming years. 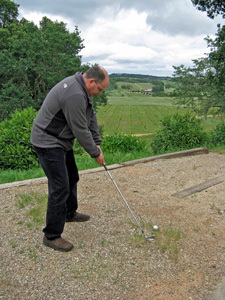 Before we left Mark’s home, he invited us onto his back porch to hit a few golf balls out toward the vineyard. After Mark hit a few, Mel and Bob showed off their golf swings – fortunately no one was hit by any errant shots! The weather still looked threatening, but as we would be inside for our next visit, we weren’t too concerned. Ranchero 2013 “Chrome,” La Vista Vineyard, Paso Robles. 100% Grenache Blanc, 100% malolactic fermentation. Very light straw color, with bright aromas of stone fruit, apples, and herbs. Medium-light bodied with vibrant acidity and a fresh finish, nice. Ranchero 2012 Viognier, La Vista Vineyard, Paso Robles. 100% Viognier, made mostly in concrete, with some fruit on the skins for 48 hours. Light straw color, this featured citrus and peach aromas along with notes of flowers and spice. Richer on the palate than the “Chrome” with a lively texture and long finish. Ranchero 2013 Rosé, “Galaxie,” Paso Robles. 50% Carignan, 30% Mourvèdre, 20% Grenache. Very light salmon color, showing savory herbal notes upfront with strawberry, earth, and spice in support. Medium-light weight with good balancing acidity and just a hint of tannin on the crisp finish, nice. Ranchero 2010 Carignan, Colombini Vineyard, Mendocino County. From 90-year old head-trained vines in Redwood Valley, made with 100% whole clusters. Medium-dark purple, displaying earth, black pepper, and floral notes along with plum and black cherry fruit. Medium-bodied with a firm tannic finish, quite distinctive. Ranchero 2011 “Revolver,” Paso Robles / Mendocino. 50% Syrah from Alta Colina Vineyard in Paso Robles and 50% Colombini Vineyard Carignan, co-fermented. Medium-dark color, this showed similar earthy and floral elements as the previous wine along with herbs and riper, more forward black fruits. Richer mouthfeel than the Carignan, with big but fairly refined tannins. From Adams Ranch, it was a very short drive to the Denner Vineyards winery, almost directly across the road. The first order of business there was to break out our sandwiches and box lunches on the patio outside the winery. Since it was rather chilly and windy there, we didn’t waste too much time before heading into the winery to meet Amy Butler of Ranchero Cellars. I first met Amy in late 2007…met her in a bar, as a matter of fact! I was having dinner in the bar area of Villa Creek Restaurant (a prime place to spot local winemakers) in Paso Robles when I bumped into Roger Nicolas of RN Estate Vineyard, whom I’d met a few times. He introduced me to Amy, who was the winemaker for Edward Sellers Vineyard at the time. I went to visit their winery tasting room shortly afterwards, and I’ve been following Amy’s wines ever since. Originally from Ridgecrest, California, Amy told us that she first became interested in wine through reading articles by well-known wine writer Gerald Asher (former wine editor of Gourmet Magazine). 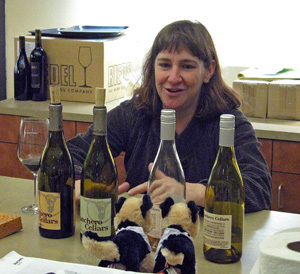 She graduated from UC Davis and worked at a number of noted wineries, including Chalone (where she worked with Ed Kurtzman), Stag’s Leap Wine Cellars, and Schramsberg, before moving to Paso Robles in 2002. She made the move in part because she felt she would have better opportunities there than in the overcrowded Napa wine environment, but it meant starting her career over nearly from scratch – her first job in Paso was as a forklift operator at Martin Weyrich! 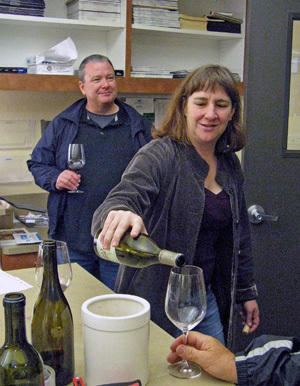 In 2004, Amy joined Edward Sellers as their first winemaker and stayed there until 2010. In the meantime, she founded her own Ranchero label in 2008. In addition to Ranchero, she has a joint wine project with Anthony Yount of Kinero and Denner called Brouhaha – they’ve been producing a value-priced Paso Robles White Wine made from Pinot Gris for several years. And on top of that, Amy has been a consulting winemaker for other Paso producers – she’s worked with Alta Colina and she’s currently with LXV Wine. Annual production of the Ranchero wines is small, only about 750 cases total in 2013. Amy has said that her winery’s name came from her 1960 Ford Ranchero, though it’s also an homage to the older ranching days of California – the feel of those days is still a part of the Paso Robles area. Ranchero has become known for its crisp Rhône-style white wines, but Amy is also committed to making high-quality Carignan (she uses the French spelling for the variety, without the final “e” that’s most commonly seen in California). It’s a grape that’s not often gotten the attention or quality-conscious treatment that she feels it deserves. Amy’s renditions have been the opposite of her light, elegant whites – her Carignans have been big, structured, and a bit rustic. We met Amy in the lab space of the Denner Vineyards facility – like a number of other small producers, she makes her wines at Denner. We gathered around the large central table, and Amy told us about her winemaking while she poured us tastes of her current releases. Her “Chrome” white may be the best-known of the Ranchero wines. As with all the Ranchero whites, the fruit was sourced from La Vista Vineyard near Tablas Creek. Amy pointed out that the 2013 “Chrome” is 100% Grenache Blanc, while some past vintages have been blends of that variety and Viognier. The bright acidity comes through from the very low pH (3.0), while barrel-fermentation with batonnage gives it some richness. Most of the 2012 Viognier was fermented and aged in a concrete pyramid tank, while part was kept on the skins for about 48 hours prior to pressing, and then barrel-fermented. For the “Galaxie” Rosé, the Mourvèdre and Grenache were picked early specifically for the Rosé, while the Carignan component was from saignée. Amy has sourced old-vine Carignan from Colombini Vineyard near Ukiah (Villa Creek also gets Carignan from there), but due to the long distance from Paso Robles, Amy has also started working with a local Carignan grower. I had tasted a 2012 barrel sample of her Paso Carignan at this year’s Rhone Rangers event, and it was quite promising. Amy has used 100% whole clusters in her Carignan, foot-trod in small fermenters and kept cool to cold-soak for about six days. The bins are then moved outside to warm up – like all of Amy’s wines, they undergo native fermentation – and the wine is pressed slightly sweet to finish fermenting in barrels. Her “Revolver” blend uses whole-cluster Carignan and destemmed Syrah. It seems like Amy has been around the Paso wine scene for a long time, and although she’s certainly established herself as a talented vintner, her Ranchero wines still fly below the radar. The white wines are more restrained than many whites from Paso, though I wouldn’t describe them as delicate – they still pack plenty of flavor and body to go with their bright acidity. And as noted above, the Carignan as well as the “Revolver” blend are bold and structured, but they’re unlike typical Paso Robles reds. The 2013 renditions of the “Chrome” and “Galaxie” were particular favorites, and the 2010 Carignan was a very distinctive example of that variety. 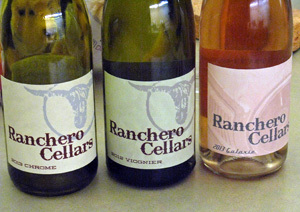 Amy’s Ranchero wines certainly deserve wider attention, and they’re well worth seeking out. 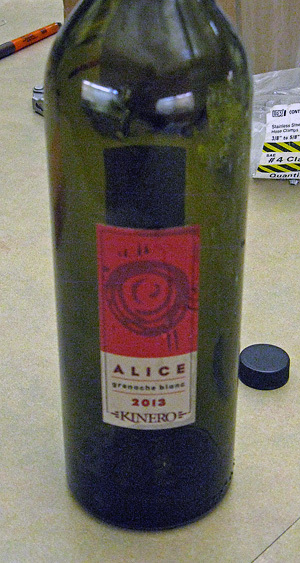 Kinero 2013 Grenache Blanc, “Alice,” Paso Robles. Sourced from three vineyards, made in 50% each stainless steel and concrete, no malolactic fermentation. Very light straw color, with lemon and green apple on the nose with touches of fresh herbs. Medium-light bodied with a slightly chalky texture and clean finish. Kinero 2013 Picpoul Blanc, Luna Matta Vineyard, Paso Robles (barrel sample). Very light straw color, this featured bright citrus aromas plus a leesy note. Zippy acidity in the mouth with a chalky texture on the long, fresh finish, nice. Kinero 2013 Chardonnay, Talley Vineyard, Arroyo Grande Valley. Light color, showing pear, citrus, and spice aromas. Medium-light weight balancing fine acidity with a mildly creamy texture, and a long, tasty finish, nice. Denner 2012 “Ditch Digger,” Paso Robles (barrel-aged component). 50% Grenache, 20% Syrah, 15% Mourvèdre, 10% Cinsault, 5% Counoise, 50% whole-cluster fermentation. Medium purple color, with aromas of plum, spice, and a distinctive stemmy component. Medium-bodied with a lively mouthfeel, finishing with big, chewy tannins. Denner 2012 “Ditch Digger,” Paso Robles (concrete-aged component). 50% Grenache, 20% Syrah, 15% Mourvèdre, 10% Cinsault, 5% Counoise, 50% whole-cluster fermentation. Similar color to the previous wine, this displayed brighter aromatics that added a notable floral character. Brighter texture on the palate, with big but more refined tannins on the finish. Denner 2012 “Cirrus,” Paso Robles (barrel sample). 100% Grenache, about 33% whole-cluster fermentation, aged entirely in concrete. Medium color, showing red fruit and herbs on the nose, with undertones of spice and pepper. Medium-bodied with fairly bright acidity, finishing with chewy tannins. Denner 2012 “Stratus,” Paso Robles (barrel sample). 75% Mourvèdre, 25% Counoise, 100% whole-cluster fermentation, aged entirely in neutral oak. Medium-dark color, with strong floral aromas plus plummy fruit, earth, and spice. Medium weight and lively in the mouth, this had a grippy tannic finish – needs time but quite intriguing. Denner 2012 “Dirt Worshipper,” Paso Robles (barrel sample). 95% Syrah, 3% Viognier, 2% Roussanne, 50% whole-cluster fermentation, aged in about 25% new oak. Dark purple color, this featured notes of both red and black fruits, rare meat, herbs, and vanilla/oak. Medium-full bodied with a richer, slightly chalky texture and big but not aggressive tannins, nice. Denner 2012 Marsanne Vin de Paille, “Pelea,” Paso Robles (tank sample). 100% Marsanne, 250 grams per liter residual sugar, tasted from concrete tank. Light orange / gold color, with intense aromas of apricot, fresh herbs, and honey. Rich mouthfeel but with good balancing acidity, and a long smooth finish – tasty now and should age for years. Anthony Yount joined us after Amy finished up our tasting in the Denner lab. Anthony is the winemaker for Denner and also has his own label, Kinero. As mentioned earlier, he and Amy collaborate on a joint project called Brouhaha as well. Anthony’s achievements as a winemaker are especially impressive considering that he’s not yet 30 years old! Anthony grew up in St. Louis, and studied agriculture at Cal Poly San Luis Obispo. He started out in the wine industry doing cellar work at Denner, beginning in 2006. 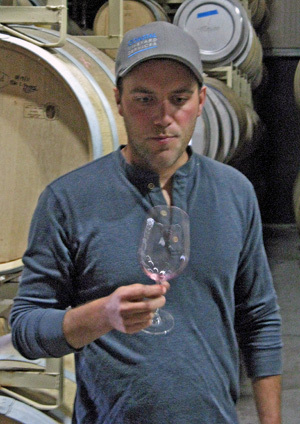 After moving on to become cellarmaster at Villa Creek Cellars, he returned to Denner in 2009 to become their winemaker. Anthony’s rapid ascent in the Paso winemaking world has not gone unnoticed – he was named a 2013 “Winemaker to Watch” by the San Francisco Chronicle. 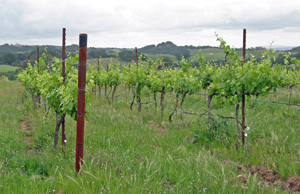 Denner Vineyards was founded by Ron Denner, and most of their 108-acre estate vineyard was planted in 1999. There are 19 grape varieties planted there, mostly Rhône and Bordeaux varieties along with a few others such as Vermentino and Zinfandel. In addition to using their fruit for the Denner wines, they sell a good deal of it to other top local producers, including Linne Calodo and Villa Creek. Surprisingly – since Denner is known mostly for their Rhône-style wines – Cabernet Sauvignon takes up the largest percentage of the estate vineyard, though it’s followed by Syrah. 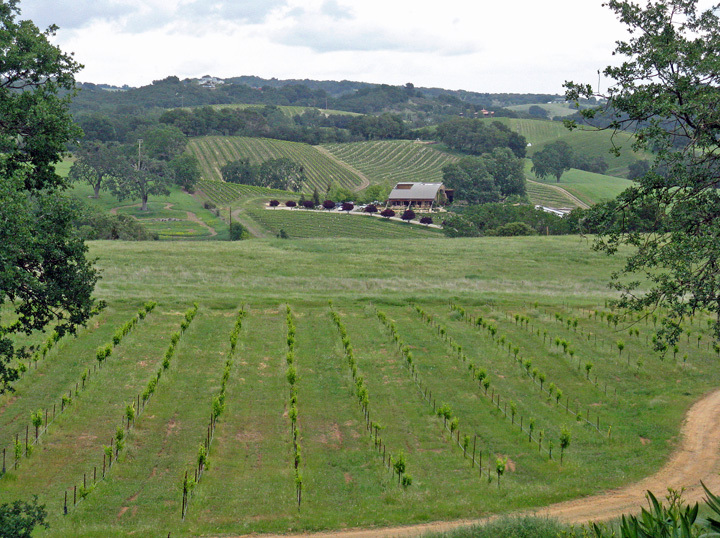 The rolling hills of the vineyard extend from Vineyard Drive on the west (where the winery entrance is located) to Willow Creek Road on the east (just across from James Berry Vineyard). Denner produces a number of bottlings, with a focus mainly on red and white Rhône varieties (both varietal bottlings and blends), and they also make Zinfandel and Bordeaux reds. Though most of Denner’s wines are reds, Anthony’s Kinero label has focused exclusively on whites. He’s said that it’s been an effort to produce interesting white wines that his father – who claimed that he only liked reds – would enjoy. It helps that Paso Robles has few producers that specialize in white wines, making it easier to stand out from the crowd. Having his own label also allows Anthony more freedom to experiment than he’s able to do with the Denner wines, so he’s worked with skin contact on some whites as well as different techniques in fermentation and aging. He even bottled the Kinero wines in 500ml bottles in the past, though he’s since switched to more standard 750ml ones. Some techniques that are successful with the Kinero wines may be used afterwards for Denner. Being a side project, it’s not surprising that the Kinero label is still quite small, with only around 700 cases produced per year. In addition to his work with Denner and Kinero, Anthony has planted his own vineyard on property he purchased in recent years in the York Mountain appellation, just west of the Paso Robles AVA. He’s planted mostly head-trained Grenache there, along with some Mourvèdre and Syrah, and smaller block of Clairette. His plans are to produce wines from his estate fruit there at some point in the future. We started our visit with Anthony by tasting a few of his Kinero wines in the lab. The 2013 “Alice” Grenache Blanc fruit was sourced from 50% Self Family Vineyard (formerly Blackseth Vineyard) and 25% each from Luna Matta and Alta Colina vineyards. Next was a barrel sample of 2013 Picpoul from Luna Matta Vineyard on Peachy Canyon Road. He’s worked with that variety in the past, having produced a Picpoul / Grenache Blanc / Chardonnay blend called “Cabrida Blanca.” Anthony told us that he’s thinking of producing a sparkling Picpoul – it’s natural high acidity lends itself well to sparklers – but he’s not yet sure what he’ll do with the Picpoul that we tried. It seems like it would be a great blending component and perhaps worth bottling on its own. We finished with a 2013 Chardonnay sourced from Talley Vineyard. Kinero also features a Roussanne sourced from James Berry Vineyard called “Rustler,” but we didn’t taste that bottling on this visit. The wines all displayed fine acidity (noticeably more than most Paso whites) and showed an interesting chalky minerality as well. Following our tasting of his Kinero wines, Anthony led us into the barrel room to try some barrel samples of 2012 Denner wines, which were to be bottled not long after our visit. The Denner facility was built into a hillside to allow for gravity flow, so we headed down a broad ramp to the barrel room. Like a number of producers – particularly for Rhône varieties – Anthony has been using more concrete tanks for aging wines in recent years. He told us that he likes the aromatics from aging wines in concrete but also likes the texture of barrel-aged wines. We started our tasting with a sample of the Denner “Ditch Digger” blend that had been aged in barrel and then contrasted it with one aged in concrete (these would both be components of the finished wine). These were both distinctive components that should combine to make a fine finished wine – it would have been interesting to try a blend of the two. Among the other barrel samples we tried were two brand-new 2012 bottlings for Denner – “Cirrus” (100% Grenache) and “Stratus” (75% Mourvèdre, 25% Counoise). The “Stratus” displayed very strong floral aromatics – Anthony feels that is characteristic of the terroir in the Willow Creek growing area. We wrapped up our tasting with the 2012 “Pelea” Marsanne Vin de Paille. I had tasted this wine with Anthony just over a year earlier as it was being racked from barrel to a small concrete tank so it was great to find out how it had developed over that time. The fruit for “Pelea” was picked at around 22 brix and dried to concentrate the sugar – it got up to 44 brix before pressing. Since Anthony has been at the winemaking helm of Denner, there’s been a subtle but unmistakable shift in style. The more recent Denner wines have not been as ripe, rich, and oaky as earlier vintages – a move that naturally has not been to everyone’s liking but one that I think has pointed the wines in a better direction. Picking somewhat earlier, using more whole-cluster fermentation (up to 100% in some cases), and aging more in concrete and puncheons with less emphasis on new barriques has given the more recent Denner wines greater interest. They’re still bold wines, but with better structure and more complex aromatics than the earlier ones. While Anthony’s Denner wines retain plenty of ripe, upfront fruit, they’re clearly also built for the long haul. I particularly liked the Denner “Dirt Worshipper” and “Stratus” barrel samples, and thought the “Cirrus” and the concrete-aged component of the “Ditch Digger” showed the distinctiveness of aging wines in concrete. The Kinero white wines are a fascinating contrast from the Denner reds – while I wouldn’t describe them as “edgy,” there’s a sense of pushing the envelope a bit with Kinero, and I liked all three of the ones we tasted. Anthony’s development as a winemaker started early and has continued at a pace that tells me the wines he makes in five years may be quite different from the ones he’s making now. It should be fascinating to see where his winemaking path takes him. We’d hoped to hold our traditional Friday night barbecue at our usual spot, the barbecue area of the Black Oak hotel in Paso Robles, but we’d learned that this area was being renovated and would not be available for us to use. Try as we might, we were never able to find a good alternative venue for a Friday barbecue, so we decided to have dinner at Villa Creek again. Even with back-to-back dinners at the same restaurant, it was an entirely different experience on Friday evening, since we ordered from the regular menu rather than having the special menu we’d had the night before. It was another enjoyable dinner, and of course we uncorked quite a few terrific bottles that we’d all brought along – a fine way to end our first full Rhône Reunion day together.